What is it about buttons that makes them collectible, and what drives the interest to collect them in the first place? Our connection to buttons begins almost with our earliest memories. It is a largely unmarked yet still very satisfying rite of childhood passage when, around the age of four or five, we first master the dexterity needed to button and unbutton for ourselves. Antique buttons were produced using all sorts of materials at hand, from stone and metal, to ceramics and glass, to bone and antler. To collect buttons is to collect the story of how we as a species have historically chosen to outfit our persons. Originally, buttons weren’t arranged in rows, but were used individually as stylish accents. These early buttons usually consisted of a flat decorative face that fit into a loop. (Reinforced buttonholes weren’t dreamed up until much later, during the 13th century). Buttons, along with buckles, brooches, and pins, were used by the ancient Romans as decorative closures for complex garments. Among the earliest buttons were ceramic Satsumas from Japan. Made in the 17th century by potters, these decorative buttons were painted in intricate detail, with depictions of miniature scenes from daily life and the natural world. Satsumas didn’t find their way to Europe and North America until the mid- 1800s, one reason they are highly collectible. 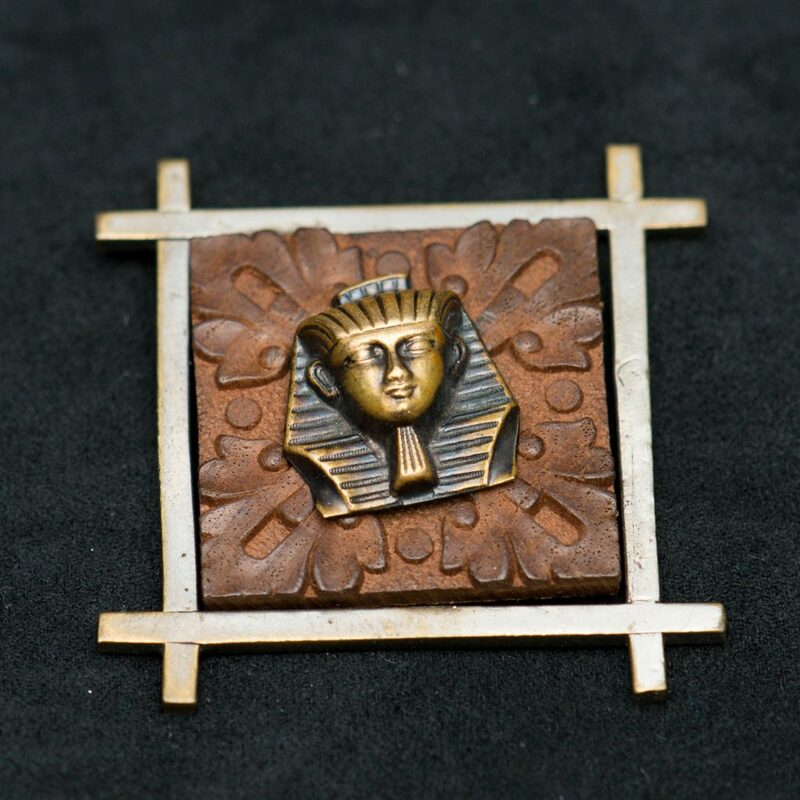 Also valuable are brass Victorian picture buttons, which were stamped with images inspired by popular entertainment, from children’s books to Gilbert and Sullivan operettas. 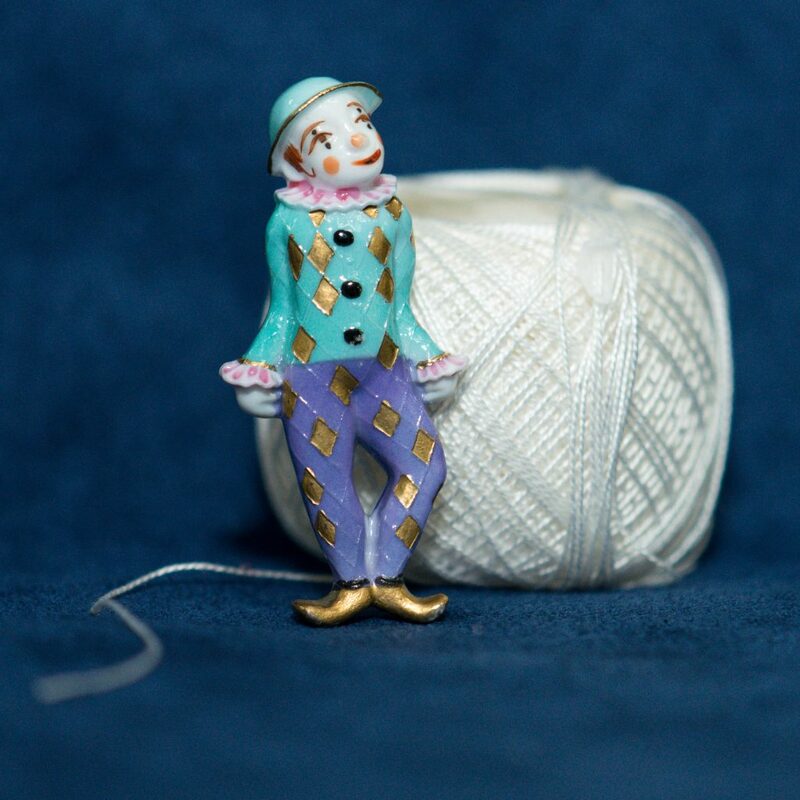 Victorians who wanted to express their fancy for an author or work would sew buttons decorated with scenes from the novel or play on their shirts or coats. 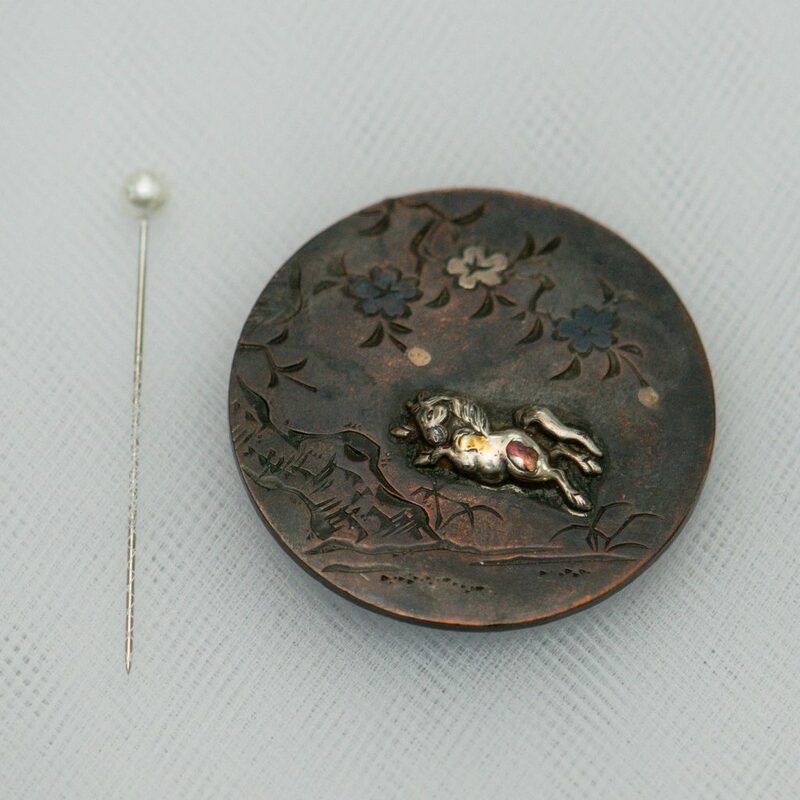 Other picture buttons were adorned with images of flora and fauna, astronomical bodies, and mythology. 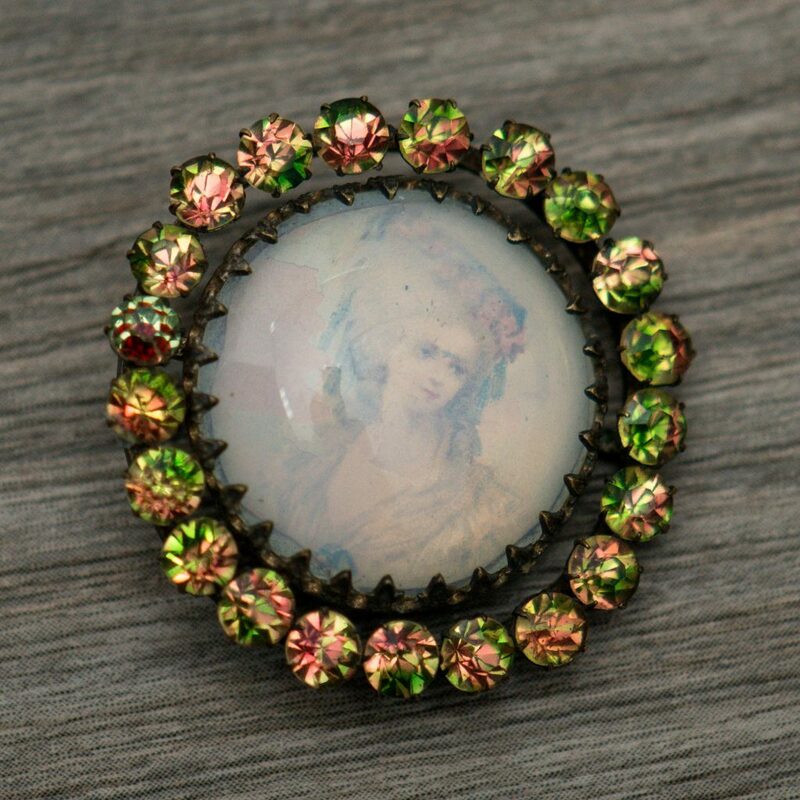 Another collectible Victorian original is the black glass button, which became fashionable after 1861, when the Queen’s husband, Prince Albert, died, and she took to wearing mourning black, leading to a rise in the popularity of black clothing and jewelry. The first black buttons were made from jet, a fossilized mineral. But the expensiveness of jet led to black glass being substituted. Between the First and Second World Wars, glassblowers from Bohemia, now part of the Czech Republic, produced another popular collectible type of glass button. 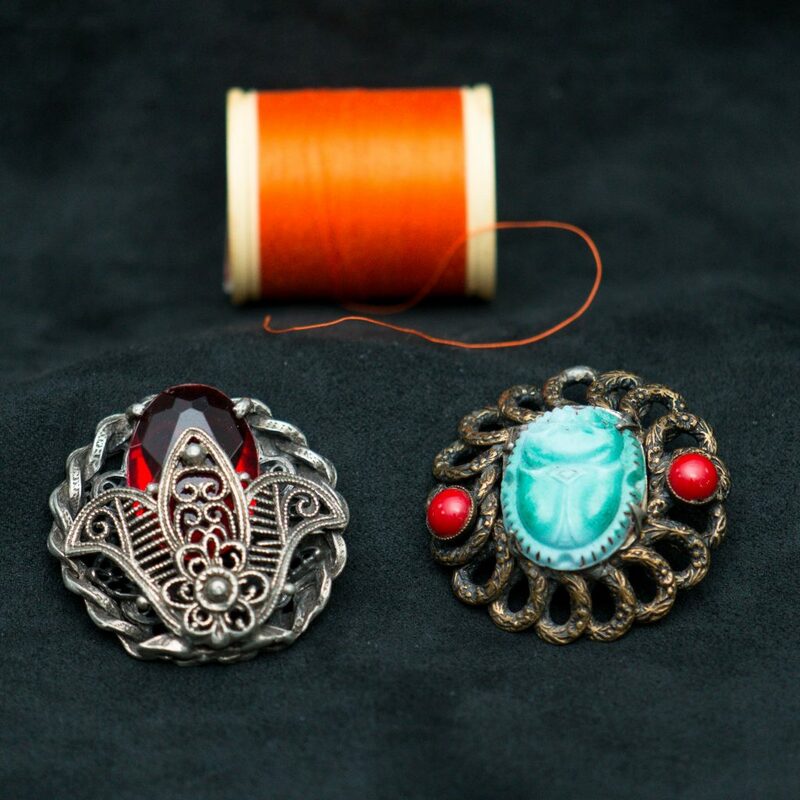 The styles ran from Art Deco to buttons produced in the shape of the objects they depicted, known as “Realistics.” After World War II, Bohemian artisans produced “Moonglow” buttons with opaque bases and clear glass faces. Most of these post-war Bohemian buttons were produced for export to Russia, as seen by the button cards written in Cyrillic script. lso noteworthy are 19th and 20th century enamel buttons. 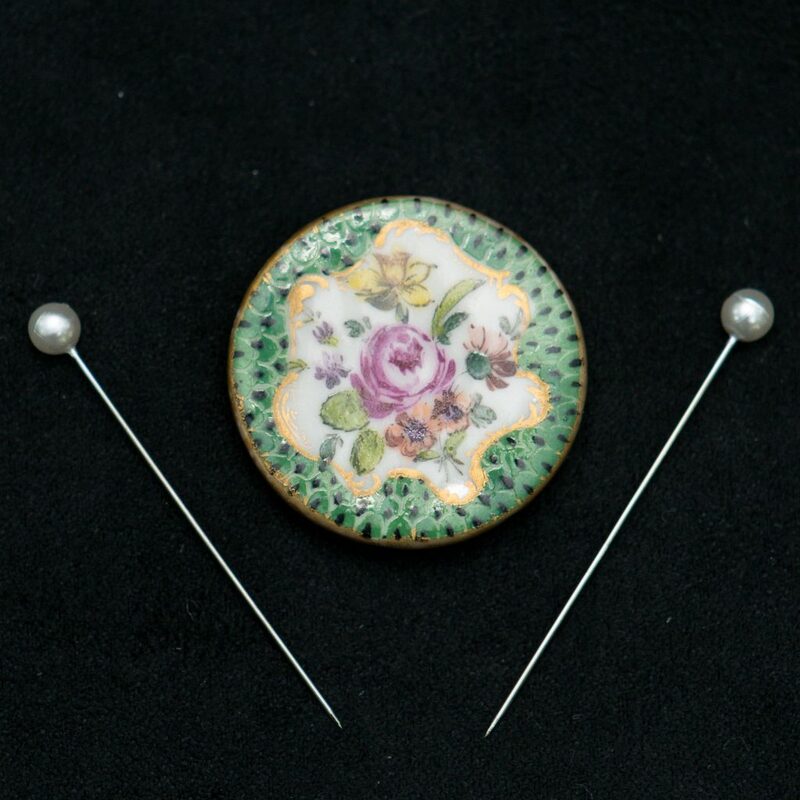 Cloisonne buttons were difficult to produce because the process required that tiny threads of wire be soldered to a base. The cavities were filled with enamel and the button was fired. 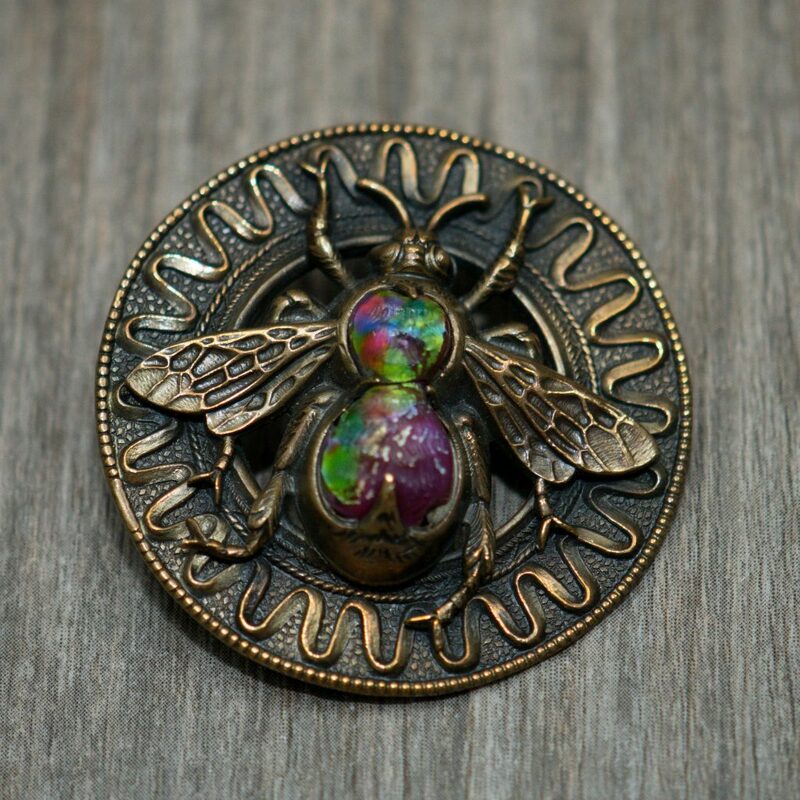 Champleve enamel buttons are also beautiful, but generally less expensive to collect because the process of creating them was easier than with Cloisonne. Celluloid was the first man-made plastic, developed in the 1800s from cellulose, a derivative of wood and cotton fibers. Celluloid buttons became popular from the late 19th century through the 1920s. Bakelite was the first completely synthetic plastic, invented in 1904 but not used for making buttons until the 1920s. 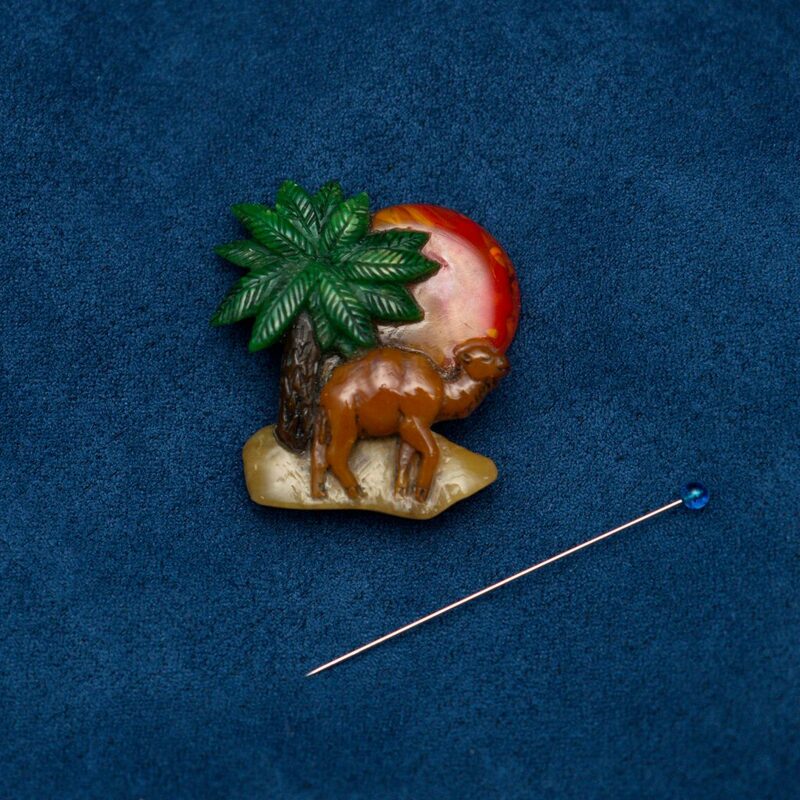 Bakelite buttons were often carved and embellished with a metal escutcheon in the shape of a plant or animal. Others were decorated with glass sequins or costume jewelry. Although not the first plastic buttons, Bakelite buttons are highly collected. The American tradition of political buttons began with the first inauguration of President George Washington in 1789. These “Washington Inaugurals” were made using copper, brass and Sheffield plate (copper plated with silver, produced in Sheffield, England between 1760 and 1840); they are extremely valuable cultural artifacts. 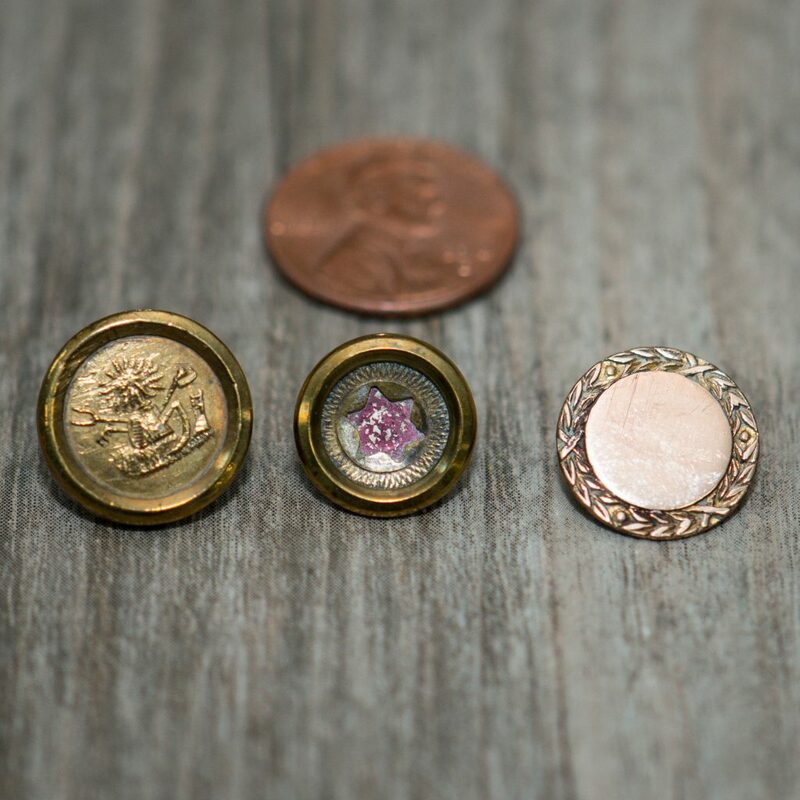 Unlike other collectibles, buttons have few parts. There is the face, which can be painted, embroidered, or carved. The back is home to the button’s shank, the loop that allows a button to be attached to an article of clothing. 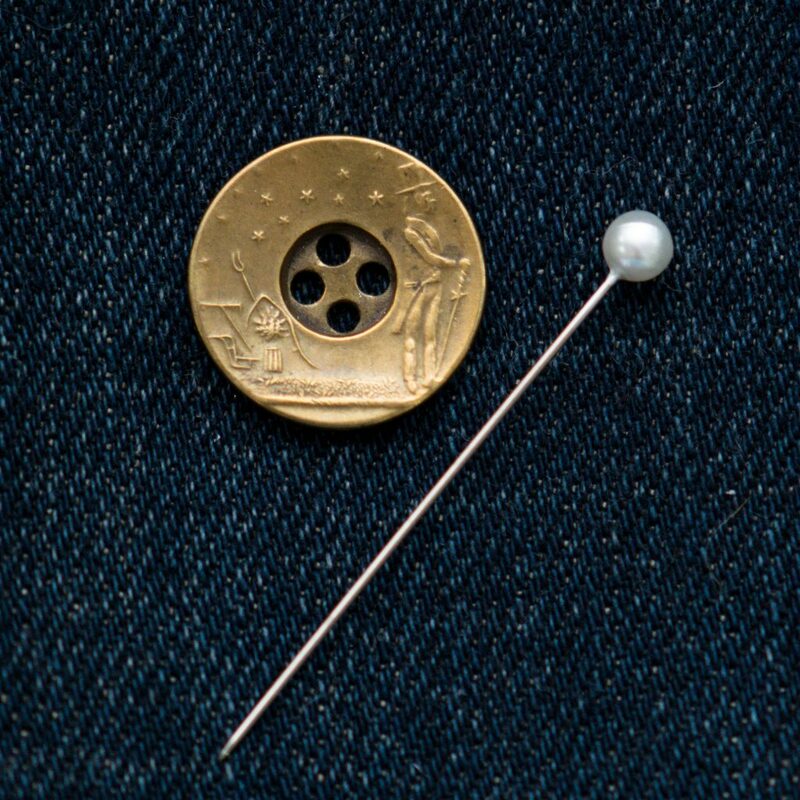 Some buttons have no shank; instead, the button is pierced with two, three, or four holes so it can be sewn onto a garment. Among their collections, several museums possess culturally, historically, and artistically significant buttons. The Smithsonian Institution in Washington, D.C. has many buttons in its jewelry collection, as does the Victoria & Albert Museum in London. A benefit of button collecting is that you can literally find them everywhere. From garage sales to flea markets and trade shows, buttons abound. A button collection might invoke fond childhood memories. Some vintage button collectors specialize in Art Deco, while others collect based on themes—cats, Asian imagery, historical people, dragons, etc. Collectors of Bakelite, porcelain, and Jasperware find buttons made from these materials mesh perfectly with their other collectibles. The reasons for collecting buttons are as varied as the materials they’ve historically been made from, and the people who collect them. The National Button Society will hold its annual convention August 19 to 25, 2018 in the Hyatt Regency Riverfront, Jacksonville, FL. For more information, visit NationalButtonSociety.org. Whitley’s Auctioneers in Dania beach, FL will host an Auction of Antique, Vintage and Collectible Buttons the weekend of October 26-28, 2018, a three-day event showcasing all movements in button design from the 18th Century to the present day. Many of the lots will be auctioned for the first time and are expected to set new records. For more information, visit WhitleysAuctioneers.com.